Phong Điền is a rural district of Cần Thơ in the Mekong Delta region of Vietnam. As of 2003, the district had a population of 102,621. As of 2004, the population had risen to 102,699. The district covers an area of 119 km2 (46 sq mi). Phong Điền was established by Decree No. 05/2004/ND-CP dated January 2, 2004. 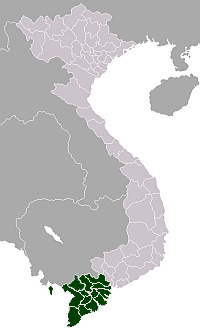 To the east it borders Ninh Kiều District, Cái Răng District, and to the west it borders Hậu Giang Province, and Bắc Bình Thủy District. ^ a b "Districts of Vietnam". Statoids. Retrieved March 13, 2009. This article about a location in Cần Thơ, Vietnam is a stub. You can help Wikipedia by expanding it.